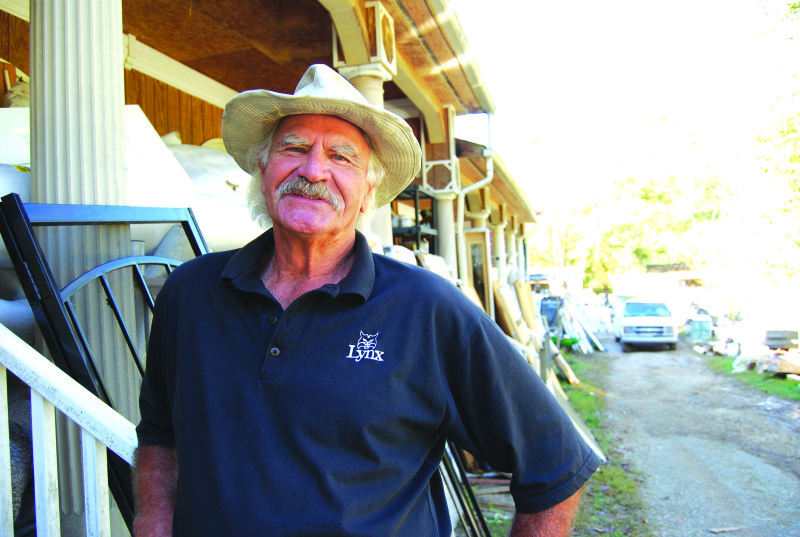 KEN BECK photo Manchester's energetic Tink Driver offers an astonishing array of goods, ranging from building materials to appliances, at low prices at Driver Sales on Opossum Paw Road in the Coffee County community of Gossburg. Here at the end of Opossum Paw Road in tiny Gossburg, about seven miles south of Bradyville and three miles north of Beech Grove, Tink Driver's got everything. Doors, windows, weedeaters, flooring, tiles, plywood, bathtubs, concrete blocks, Jacuzzi tubs, vanity tops, cabinets, carpet, appliances, refrigerators, and, yes, even the kitchen sink. And it's all for sale, and the prices are right. Whatever you need for a house, it's here somewhere. You just have to find it. "People come from everywhere within a hundred miles. I treat people good. Everything is fully guaranteed and really, really cheap," says Driver, 74, who has about 30 buildings on his property bulging with, well, you name it, he's got it, all low-clearance items, which he trucks in from home improvement stores around the midstate. This October afternoon shoppers Lenny and Thomas Conry of Tracy City are looking here, there and everywhere for lumber and whatever else might strike their fancy. They've been several times before and purchased a washer and dryer, a lawn mower and flooring. "My nephew and niece told me about this place," said Thomas. "The prices are way below everywhere else, a lot cheaper, about one-third of normal cost. He doesn't make much money. He just does it to help people. Pretty much he does it for fun." Sally, who moved into a house in Beech Grove a year ago, drops by with a list of items her boyfriend asked her to try and find. "I had to make some repairs. Neighbors said, 'You need to go to Tink.' This is my fourth trip. I have repaired my home for cheap here," said Sally, who refers to Tink as "the unofficial mayor of Gossburg." Also here this afternoon, poking into sheds and checking out piles of lumber and concrete blocks, is James Carlton of Murfreesboro, who has been remodeling a ranch-style house over the past two years. "I bought about 80 percent of my material from here. Doors, windows, sheet rock, plywood, pretty much any interior and exterior doors," Carlton said. "It averages 30 to 40 cents on the dollar. It's scratch and dent. You never know what you may uncover when you lift up a tarp. That's the key, you gotta dig." Driver, who was born in Nashville and moved to Manchester when he was in the eighth grade, found and purchased the property in the 1960s. He discovered it while he was hitchhiking between home and Middle Tennessee State University. "This all started when I retired from the 'Reader's Digest' nine years ago," said Driver, who worked for the national publication for 38 years and was one of its four vice-presidents of sales. "It's gonna be a retirement community with a nine-hole golf course. I needed something to do. I was bored. I'm a workaholic. I work seven days a week." Today, he has already driven his truck to pick up loads from two big home-improvement stores and a door store. With most of his buildings filled to the brim with items, there are tons of goods in stacks along his long driveway. The abundance leaves first-time visitors thunderstruck and wondering just where to begin. "We ask people to come out and spend part of a day. It's hard to look for a few minutes. Plan to stay a while and look through all the barns," said employee Ronnie Manus of Woodbury. "Tink does warranty everything. No questions asked. "Tink has had two hip replacements and a pacemaker put in," Manus added. "And he's got enough energy to run circles around three young boys." The location, off of Highway 64, is in the middle of Mother Nature in the northwest corner of Coffee County. At the back edge of this property runs Morgan Ridge, only 1,000 yards east of the Rutherford County line. Four miles to the north is Cannon County. It's about the last place one would expect to find bargains galore. But for Driver, who enjoys sipping Sun Drop Cola, and, when he takes off his sunglasses, looks like author Mark Twain, this a business that gives him a chance to give folks a fair shake. "I buy glass by the truckload. People come here and get the lumber to build barns and homes. I sell good lumber about half price. I've sold a lot of expensive stuff. A lot of cheap stuff," he said. One example of a good deal is a new cast-iron, double-ended pedestal bathtub showing a sticker price of $1,332. Driver has marked it down to $650. He said prices can range from $1 to $2,000; the latter being his price for a $3,500 door. Open 2:30-4:30 p.m. Monday-Friday and 8:30 a.m.-4:30 p.m. Saturday-Sunday, Driver Sales can be a difficult place to get to because the road sign on Highway 64 is missing as folks steal them almost as soon as a new one goes up. But it's certainly worth the hunt, for two reasons: the prices and Tink's personality. "I like meeting new people. I have a great Hispanic trade on Sunday. They come from Shelbyville, McMinnville, Murfreesboro. It's an exchange of cultures. I can't speak Spanish, but we understand each other. I treat everybody equal," said Driver. "If you treat people right and are honest, that's what it takes to be successful." Then he notes, "My wife says I give away more than I sell." Judy, Driver's wife of 55 years, worked at Arnold Engineering for 32 years. She says of her mate, "He has always been working on something and planning another. He enjoys all the people that come and shop whether they buy or not. He does like to help out if you are looking for a deal." Before selling advertising across the South for "Reader's Digest," the go-getter taught in the Manchester school system for six years. He also developed Country Club Estates near Old Stone Fort in Manchester and back in the 1980s was one of the largest cattlemen in Coffee County. About four years ago Driver purchased a building constructed of limestone in 1925 that served as a bank, post office and voting hall in Bradyville. "What a beautiful building," he said of the structure. "I need photos of the interior because I want to restore it like it used to be. It's got the old marble floors, but they're worn out, and a big walk-in vault. I want to restore the bank so one day somebody will say, 'That Tink Driver did something for Bradyville.'" Born Eugene Driver, the salesman said he got the nickname Tink from his father when he was a youngster. "My daddy said I tinkered with everything since I was little, and I haven't stopped." While wining and dining big-time advertisers over the decades, Driver also entertained them on golf courses everywhere. "I played golf a lot around the world with clients, every famous golf course in the U.S.," he noted, as he rattles off such sites as Pebble Beach, Pinehurst and Spy Glass. He's also hit the fairways and greens on courses in Ireland, Germany, Spain and Portugal and says at his peak he played scratch golf. Tink and Judy have been generous donors to Motlow State Community College, and the baseball stadium and athletic complex was named Driver Baseball Complex in their honor in 1996. He has a nine-hole golf course roughed out in his corner of Coffee County, but it's not playable. He plans to name it Shenandoah of Tennessee and build homes overlooking the course. Driver said he works 13 to 14 hours a day, winding down by mowing this plot of grassy earth every night until dark. "If I live two more years, I'll get it finished," he says about his goal of transforming Tennessee's biggest indoor/outdoor barn and yard sale into a place for senior citizens to play golf during their golden years.